I have a big head. It’s 24″ in circumference, which is an inch or two bigger than most commercial sun hats. 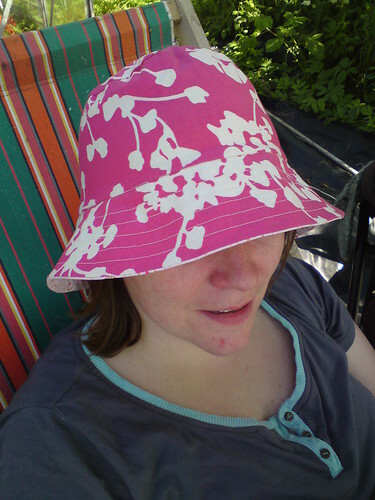 Therefore I’ve gone without a sun hat for the last few years, always searching but not finding one that would work. 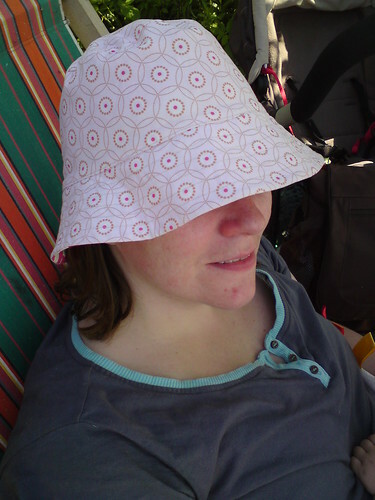 This year I decided that enough was enough and that I would make my own bloody sun hat! Luckily I found McHats who was an utter star. She made me a custom pattern that fits brilliantly, and which arrived far sooner than I expected, given that it was a custom job and was coming from Australia. She also emailed me tutorials which taught me everything I needed to know about making sun hats. Oh and she sent me two crown patterns so I basically got two patterns for the price of one. I’m planning to make another in some Heather Ross fabric I bought recently. And since – as luck would have it – the pattern also fits W’s big head I’m going to make him a bucket version in linen too. Yay! Your hat looks great! My head is the same size as yours ! Obviously an indication of superior intelligence.